Nobody wants to deal with unexpected garage door related problems, especially not when you're hurrying to leave the house, or when you come back home after a long work shift. The best way to avoid these scenarios is to have your system undergo routine maintenance. Let's focus first on the aspect of performance. Your garage door system is comprised of many different moving parts, all of which are prone to suffer from wear and tear damage due to the nature of their operation and the great deal of tension they are under. Making sure your springs, for example, stay in a good condition will not only help to ensure the system's operational safety, it will also make the whole system operate smoothly for much longer. Our specialists will closely examine your springs, along with your cables and rollers and every other part that's directly involved in the system's operation. If any part is found to be damaged we'll replace it on the spot. There's really nothing more important than safety. By making sure your garage door is routinely inspected and all of its moving parts are properly lubricated by our experienced technicians, you're effectively making sure of two things: the first one, which we already covered, is that the system is able to perform optimally and efficiently for much longer than it would otherwise. The second one, which is more important, is that the system's potential to malfunction gets reduced to the absolute minimum. The risks involved in unexpected problems are incredibly dangerous, and the best way to try and prevent them is by making sure everything is in the best possible shape. What do we mean by collateral damage? Here's an example: When a spring breaks, a tremendous amount of tension gets released. That means that other parts of your system, such as the cables, the panels, and any other spring, also get damaged, simply from having to suddenly compensate. 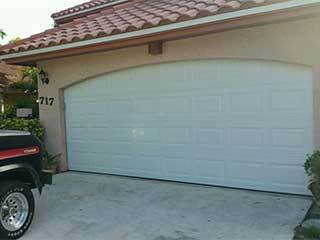 Our experts at Garage Door Repair San Diego can make sure your system stays safe to use and that all of its various parts are in the best condition possible. Call us today to schedule an appointment.